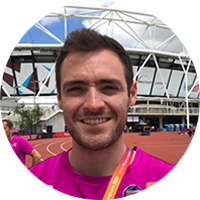 ESO alumnus Peter Horobin specialises in sports osteopathy and currently practices within a multidisciplinary clinic in London. He has worked with a number of sports teams and in 2017 was selected to be part of the medical team for the World Para Athletics Championships. Peter also tutors part-time in the ESO Clinic, sharing his postgraduate expertise with the next generation of osteopaths. What made you decide to be an Osteopath? To be completely honest, I had no idea what I wanted to be when I was at school. I did work experience everywhere I could in a desperate attempt to find my future calling and after deciding against marketing, dentistry, architecture, graphic design… the list went on… my mum said, “What about becoming an Osteopath like that nice lady who treated you years ago?” Luckily, I’ve found a job that I love! I applied on the advice of a reputable local osteopath. He said the ESO taught the broadest range of techniques and that he was always more inclined to employ their graduates than ones from other colleges. I also preferred the idea of studying in Kent. A lot! At the time of writing I have been graduated for 7 years. A couple years after graduating, I went on to complete an MSc in Sports Medicine at UCL alongside part-time clinical work. I have enjoyed working in several sports – two summers at Guards Polo Club working with an excellent polo team and various sports tournaments ranging from hockey to rugby 7’s events. I tutor part-time at the ESO Clinic and practice at a highly reputable sports injury clinic in London alongside several physiotherapists, sports doctors, podiatrists and others. I am currently working at the 2017 World Para-athletics Championships and writing a running injury course which I am teaching abroad in a couple of months. How do you feel about being an Osteopath? I love the flexibility and diversity that the profession encourages. I particularly enjoy the challenges of clinical work – it drives me to constantly learn as you are frequently presented with challenging cases that require a great deal of careful thought and consideration. I also enjoy working in a multidisciplinary environment where it’s possible to work alongside other professionals and learn directly from them. Throughout my short career I have worked in ‘traditional’ osteopathic clinics and larger multidisciplinary ones with access to expensive rehabilitation equipment. I have been drawn into teaching, which started as a cover tutor at the ESO, and have been fortunate to speak at medical and chiropractic conferences. My sport work has allowed me to work at the Queen Elizabeth Olympic Park, Allianz Park (home to Saracens rugby club), many polo grounds (Guards, Ham Polo Club and other private venues) as well as providing pitch side work at small time rugby and football clubs on cold Sunday mornings in the rain! What advice would you give to someone looking to specialise in sports osteopathy? Get out there. Shadow lots of people – particularly from other professions – and apply for tournaments and events. Learn as much as you can about sports injury management and attend conferences and courses that interest you. For me, the best move I made was completing a Master’s degree in Sports Medicine but I have met plenty of more experienced osteopaths who don’t think it’s necessary to complete an additional degree. I also think it’s helpful to work in an environment where you are surrounded by people who are more experienced and knowledgeable than yourself – that way you can constantly learn off them.